Founded in 1914, The White House Correspondents’ Association represents the White House press corps in its dealings with the administration on coverage-related issues. A nine-member board of directors, elected by correspondents, addresses access to the President; coverage arrangements; work space arrangements; logistics and costs for press travel to accompany a president on the road. Each year starting in 1920, the WHCA hosts the White House Correspondent’s Annual Dinner where President’s get to strut their comedic stuff. Please also check out Why Humor is Important in Leadership. 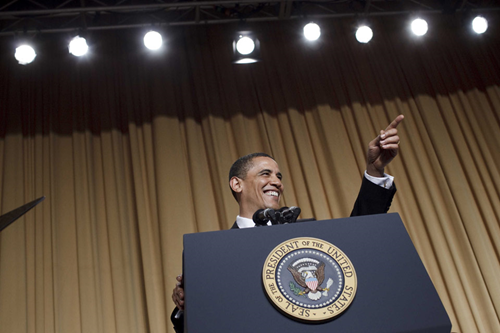 Tagged with President Barack Obama, White House Correspondents' Association.